The Great Blue Heron is the largest and most familiar heron in Tennessee. It is a year round resident and often mistakenly referred to as a “crane”. The Great Blue Heron is widespread across North America in both saltwater and freshwater habitats from southern Alaska and central Canada southward to northern Central America and the Caribbean. It spends the winter throughout most of its breeding range, with some individuals migrating to southern Central America and northern South America. Description: This large, mostly gray heron has long legs, a long “S” shaped neck, and a long yellowish bill. The head is white, aside from a black stripe that extends over the eye forming a plume on the back of the neck. The legs are brownish or greenish with rust colored thighs. In flight the Great Blue Heron typically holds its head in toward its body and looks enormous with its six-foot wingspan. Both sexes look alike. Sandhill Cranes are larger, are solid gray with a red cap, and fly with their necks extended. They are most often found in large open fields, generally in flocks, rather than as lone individuals like the Great Blue Heron. Little Blue Herons are much smaller, more slender, are uniformly dark blue-gray, and are uncommon to rare away from the Mississippi River in Tennessee. Tricolored Herons are smaller and more slender, have a white belly contrasting sharply with a dark chest, and are rare away from the Mississippi River in Tennessee. 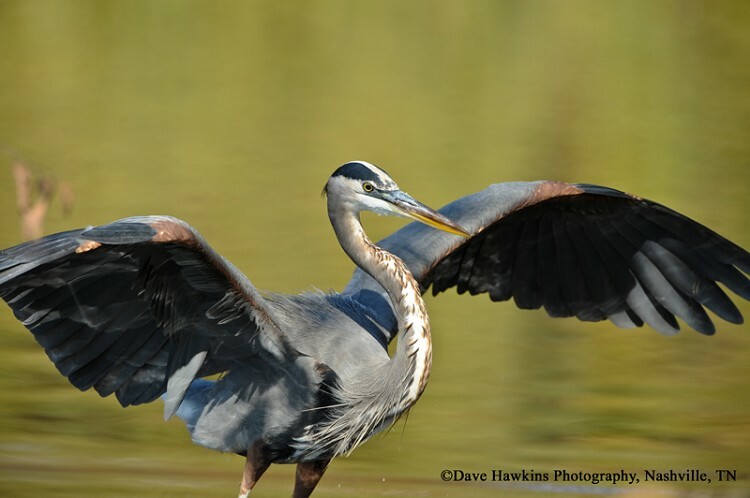 Habitat: In Tennessee the Great Blue Heron is found along lakeshores, rivers, ponds, streams, and occasionally grassy fields near water. Nesting colonies are often located on islands or in wooded swamps, locations that discourage predation by snakes and mammals. Diet: Fish, invertebrates, amphibians, reptiles, birds, and small mammals. When foraging they walk slowly, stand and stab prey with a quick lunge of the bill. Nesting and reproduction: Great Blue Herons begin reoccupying nest sites on warm days as early as January; peak egg laying is about mid-March. Nesting colonies, sometimes numbering several hundred pairs, are typically located near water and may include other species of herons. Individuals usually do not nest until at least 2 years old. Clutch Size: Usually 3 to 4 eggs, occasionally up to 7. Incubation: Both adults incubate the eggs for 28 days. Fledging: Both parents regurgitate food for the nestlings, which fledge when about 60 days old. The young continue retuning to the nest to be fed by the adults for another few weeks. Nest: Both adults build the large platform nest of sticks and line it with dry grass, leaves, or smaller twigs. Nests from previous years are often rebuilt. Nest heights range from 10' to 130'. Status in Tennessee: The Great Blue Heron is a fairly common permanent resident across the state. Colonies may contain other heron species and have a few to several hundred pairs. Great Blue Herons were listed as In-Need-of-Management from 1976 to 1986, but were removed when the population began to increase. There has been a steady growth in the number of colonies and individuals in the state since the 1980s. The Great Blue Heron eats primarily fish, but occasionally forages in fields where it catches voles and mice. Great Blue Herons have been known to choke to death trying to eat a fish that is too large to swallow. In recent years Great Blue Herons have found that fish hatcheries are easy places to catch fish, causing great concern among fish farmers. However, a study found that the fish that the herons ate were mostly diseased fish that would have died shortly anyway. Since sick fish spent more time near the surface of the water they are more easily caught by herons. Best places to see in Tennessee: Great Blue Herons can be found statewide around lakes, rivers, farm ponds, streams, and occasionally in pastures. Butler, R. W. 1992. Great Blue Heron (Ardea herodias). The Birds of North America, No. 25 (A. Poole, P. Stettenheim, and F. Gill, eds.). The Academy of Natural Sciences, Philadelphia, PA, and The American Ornithologists' Union, Washington, D.C.